For the first week of our Whole30, I meal planned like a crazy woman. I knew who was eating what, and when. Which is important when you have four people who eat two of the three meals in different places. About two-thirds through the Whole30, I got really, really tired of cooking. So tired, I was perfectly okay cooking massive amounts of food on Sunday and relying on leftovers for the next five days. Anytime our leftovers weren’t quite enough to make a meal, or if my old habits of cooking just two veggies for dinner crept back in (Whole30 necessitated at least 3-4 veggies at dinner), I made my favorite easy dinner salad recipe. I’m a huge salad fan… the Costco-copycat Sweet Kale Salad and Winter Wedge Salad and Panzanella and Southwestern Salad are all my favorites. And despite the fact that these are indeed ALREADY PUBLISHED recipes, it still feels weird to write yet another recipe for a salad. After all, salads are nothing more than lettuce with some toppings thrown in, right? However… my fellow salad lovers understand that there is such a thing as a bad salad. Lettuce – there can be too much, too little or (even worse) flavorless lettuce. Dressing – there can be too much, too little, too vinegary, too creamy or altogether just wrong. Perhaps I sound like I’m whining, but I’m really not. It’s just like steak. Steak can be chewy, tough, undercooked or overcooked… and if you’re having steak for dinner, you want it cooked properly, right? That’s how I feel about salad. I like my salads to be “the right way.” And the only way to tell you “the right way” (or at least my favorite way) to make a salad, is to write a recipe! This easy dinner salad recipe has been on our table at least twice a week for the past three months. It’s been on my own lunch meal plan at least three times a week (and I add Instant Pot shredded chicken every time). One of the reasons this dinner salad is my favorite is because it uses things I almost always have on hand. And if I happen to run out at any given moment, there are enough substitution ideas to make it work. I personally prefer granny smith apples in this salad. Hard red apples (i.e. fuji or honeycrisp) work too, but I would avoid soft apples (i.e. red delicious). The hard and tart crunch of the apple compliments the other items really, really well, and the soft sweet apple just didn’t cut it. I’ve done all three, but this time I happened to have dried cranberries from Costco. Which is awesome, because that big bag means I can have this salad as often as I want! Just a quick note on dried cranberries versus the reduced-sugar dried cranberries… it’s not just a simple case of less sugar. The reduced sugar varieties have other ingredients added, like soluble corn fiber, glycerin and sucralose. I don’t know much about corn fiber, other than it’s probably a red flag for those who have to avoid grains. Sucralose is an artificial sweetener, which I know from research can do more harm to our bodies than plain white sugar. 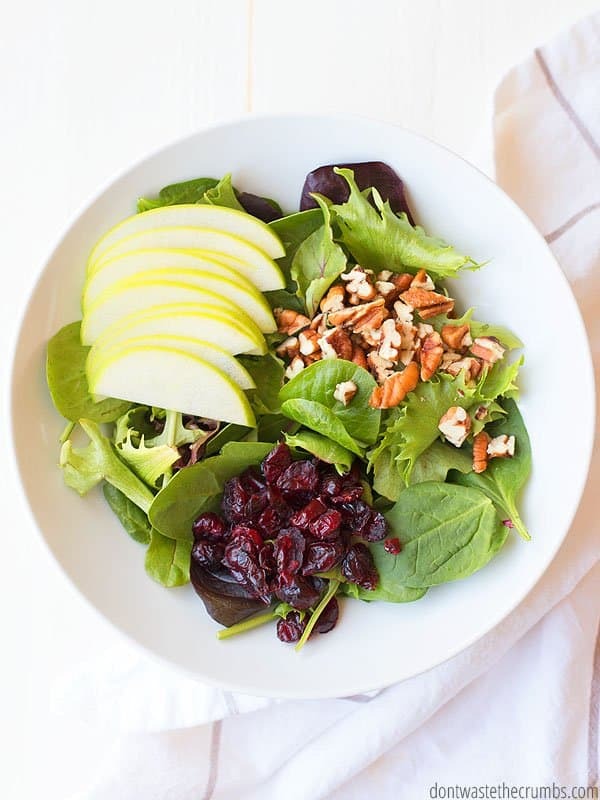 I absolutely adore the flavor that pecans give this salad. A bit of a delicate crunch but without a massive taste that will overpower everything else. My mom brought me pecans from her own backyard – still in the shell – the last time she visited. My daughter has taken up the role of resident nut cracker. That works for me because cracking pecans is HARD WORK! Before these pecans, I had leftover pecans from when I made healthier candied pecans. When the pecans ran out, and before my daughter figured out the pecans, we tried walnuts and those were nice too. If you don’t have pecans or don’t have room in the budget, almonds are a great substitution. Just be sure to chop them up so they’re in small pieces. Getting a whole almond as you take a bite of salad violates the texture rule. Obviously you need some green if you’re making a salad. I’ve been crushing hard on the packaged spring salad mixes from the grocery store. Yes, I know a head of romaine is cheaper. Yes, I know that I can make my own blend of spring lettuce. And yes, I’ve been spending no less than 12 hours prepping, chopping, cooking, putting away and cleaning thanks to the Whole30. This girl needed a little bit of convenience and considering it’s LETTUCE (and not some weird form of Whole30 compliant potato chips), I think the world will keep spinning. Other great lettuce options include red or green leaf lettuce, spinach, finely chopped romaine, butter lettuce or even a few handfuls of arugla with dandelion greens. Before I let you loose on this bad boy of a salad, let’s talk about the VIP of attendees: the dressing. 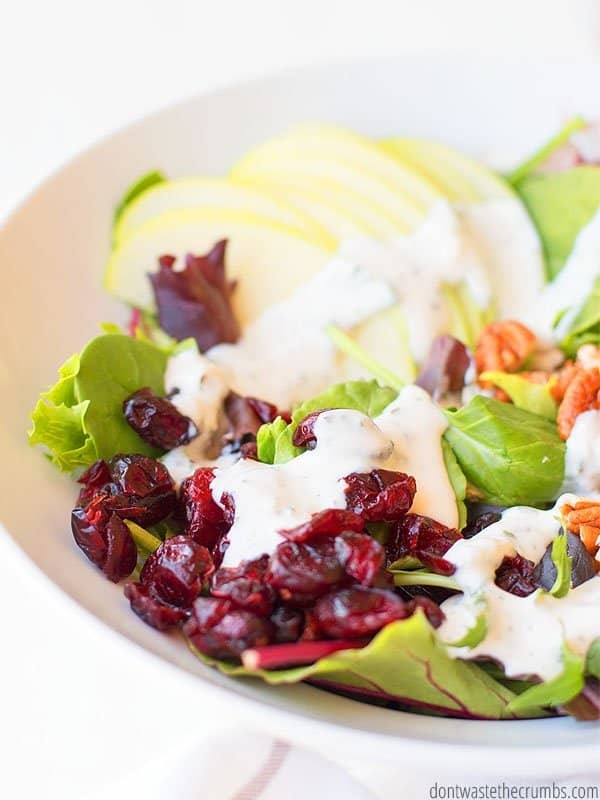 Pre-Whole30, I would have made a maple citrus vinaigrette or this tangy sweet creamy dressing. But since you always want something when you know you can’t have it, I wanted ranch with this salad. 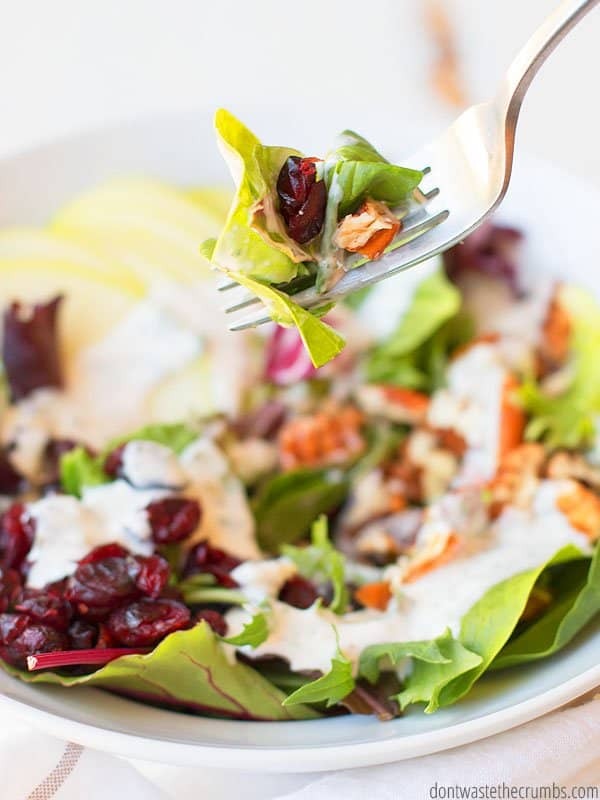 I hope to have a dedicated post to the best dairy-free ranch dressing known to the face of the earth, but until then, this recipe works! Easy Dinner Salads must have the right lettuce, toppings, dressing, and texture. You might be able to find some great prices on apples at your local Farmer’s Market. Ask for “seconds” and if they offer discounts on large orders. 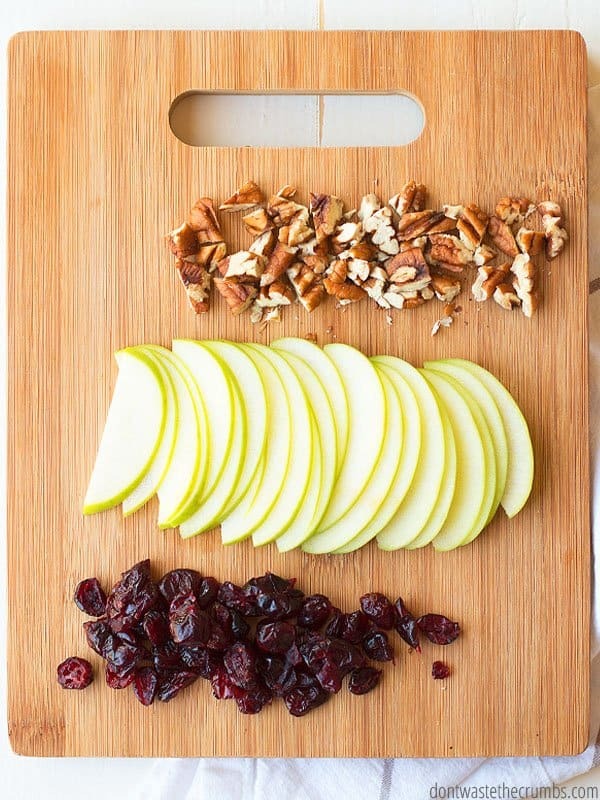 While you are stocking up on fresh cranberries to dehydrate, load up on pecans and other nuts. They tend to be on sale around the holidays and freeze well. Use this dehydrator to make your own dried cranberries! You can re-grow lettuce in water to have an ongoing to supply of fresh lettuce. Use this tutorial to find out how. Combine all ingredients in a large bowl and toss to combine. Dress the salad with your choice of dressing and serve immediately. Tell me how you like your salads – mostly lettuce, mostly topping, a combination of both? And what’s your favorite salad combination? I’d love to hear your ideas in the comments below! Your salad combinations look great. Spring and summer food choices are my favorite and I’m looking forward to many salads in the next few months. My stumbling blick is often which kind of dressing, so I’m glad for your recommendations. 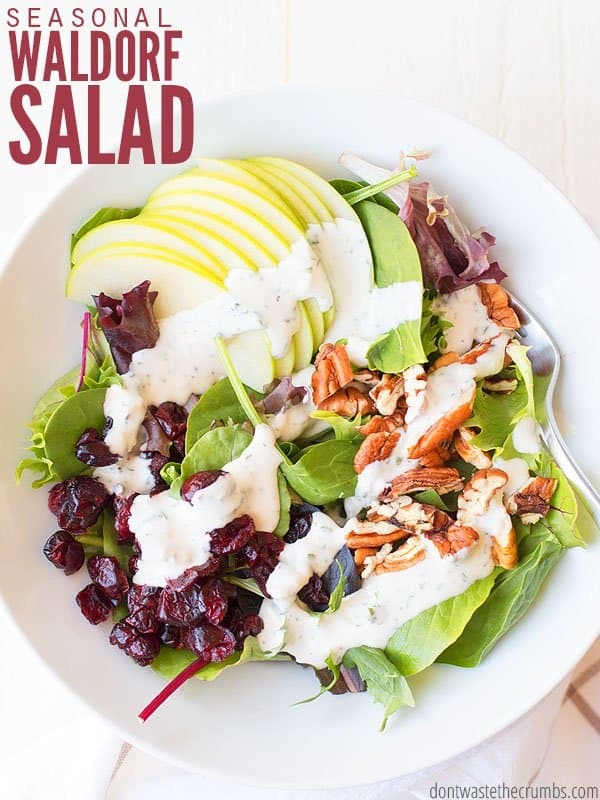 I don’t think you can go wrong with any dressing on this recipe… Italian, Ranch, Blue Cheese, Viniagrette, Honey Mustard… it’s one of the reasons why this salad is my favorite! I’m assuming you will be updating all of us on your thoughts about the diet. (I can’t be the only person. ☺) I’m especially curious about y’all, since you were already eating a pretty clean diet, if you really noticed that much of a difference. The people I have known either thought it was great (these were the people who were eating a highly processed diet, almost non-existing veggies) or people who didn’t notice much of a difference or felt worse on the diet ( these were the people who are like you and already eating a clean/fresh diet).